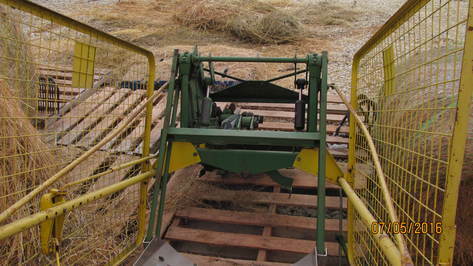 Hutcheson Seeding & Ag Services Inc. recently purchased a used John Deere Model 24T Square Hay Baler that came with a complete (includes everything) Hydraulic Bale Ejector Attachment" installed on it. We have no immediate plans for needing this attachment so we have removed the complete attachment and are listing the attachment for sale. We will not be selling off individual pieces of the bale ejector attachment, you must purchase the entire accessory item if you're interested. There is no expressed or implied warranty and is being sold in an "AS IS" condition. Terms: Cash or a certified check from your banking institution made out to Hutcheson Seeding Services, Inc. Thanks for your interest.